It doesn’t get more central than Golf 3 Hotel, but that’s all the hotel really has going for it. Ad Book now! Rates from US$40.96++. Average rating 7.7 from 444 reviews. 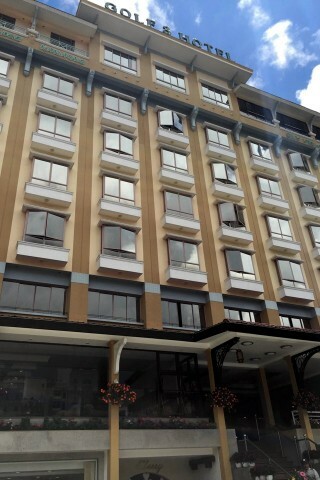 Located next to the central market and overlooking the night market, it’s a dated seven-storey hotel – big by Da Lat standards – that caters to domestic tourists and bus tours. The lobby has zero warmth and the hallways look like they have seen far better days but the rooms are actually okay, with the typical generic city hotel furniture and amenities: bedside tables, big desk, tea/coffee kit, wardrobe, WiFi, TV and plain tiled bathroom with granite counter. Golf 3 Hotel is in need of an update and there’s so much competition in Da Lat now offering better value. The reason you would choose this hotel is purely convenience of location, or if you are travelling in your own vehicle, for their underground car park. Check rates at Golf 3 Hotel on Booking.com.